Today’s Daily Prompt: Turn, Turn, Turn asks, For many of us, winter is blooming into spring, or fall hardening into winter. Which season do you most look forward to? Though I wouldn’t have a problem living in any climate whether hot or cold or dry or humid, I think I am like most folks as far as seasons go. I rejoice in whatever is coming next! Maybe I should call myself a “fair weather friend!” Because I love the promise of the changing season more than the season itself. I love the broader viewpoint that comes from observing the daily nuances—sometimes hardly perceptible—that reflect bigger planetary motions which give us a changing season and the illusion of the passing of time. This is the time of year when I crave much lighter food including a LOT more vegetables. The weather gets hot very quickly here in New Mexico and actually I’ve been adjusting my menu choices for over a month now to prepare for it. What caught my eye recently are these vibrant-looking radishes! 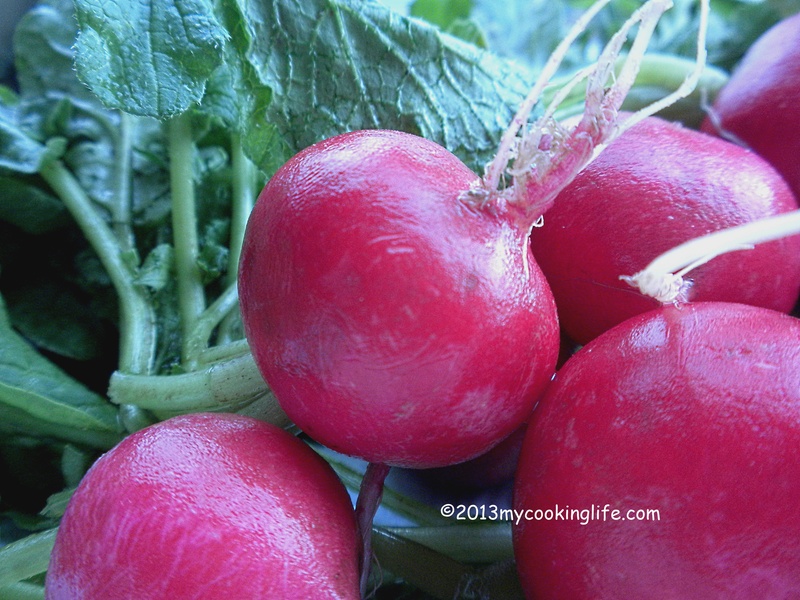 I like to make a very light pressed salad with radishes and greens when the greens are this fresh and wonderful. Wash the greens and radishes thoroughly (they can have quite a bit of sand and dirt) then separate the greens from the roots. Slice the roots thinly. The quickest and easiest way to do that is to cut them in half lengthwise and then slice vertically. A good, sharp knife makes all the difference! Sprinkle it all with sea salt and mix it around until the greens start to glisten. The salt draws some of the moisture out of the vegetables. Find a small plate that fits into the bowl and place it on top of the radishes and greens. Then find a heavy can or jar or rock and put that on top of the plate. The weight will help to “press” the salad. Press the salad at least a half hour. You can press it for as long as you like, but the longer you press it, the more “pickled” the veggies will be. I like them just lightly pressed myself. This takes a little of the raw taste out of the radishes but maintains its fresh, light character. Rinse excess salt off of the salad and spin or pat it dry. You can dress this if you want to but I don’t. Keep in mind that if you add vinegar or citrus it will turn the greens dark. So add that just before serving. I don’t trim off the green stub from the stem if it looks fresh. 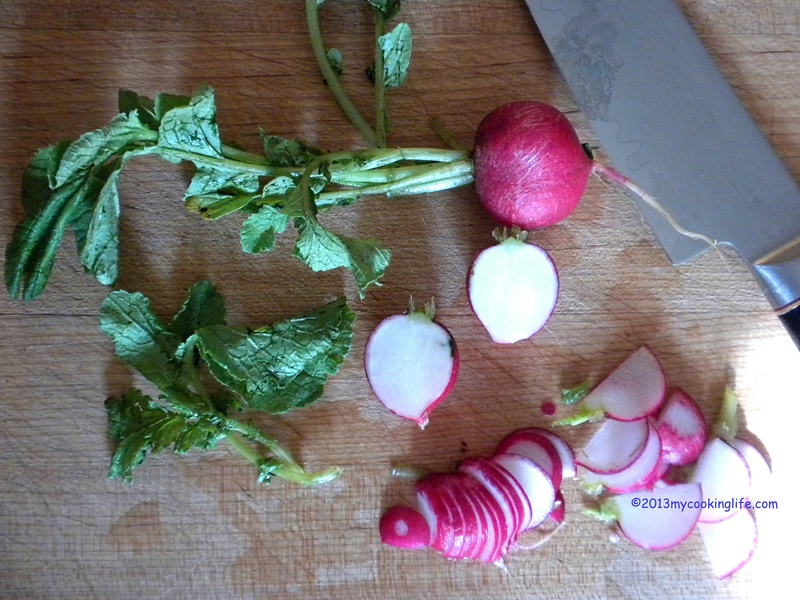 I will trim the little dark blemish on that half-sliced radish. This entry was posted in Recipes, Salads, Vegetables and tagged pickling, pressed salad, radish greens, radishes, seasonal cooking, vegetable cuttingn techniques, WordPress Daily Prompt by mycookinglifebypatty. Bookmark the permalink. Haven’t made pressed radish salad in a long time, but now feel inclined. Sometimes I avoid buying radishes because I don’t know what to do with them. This is a good idea! I love the colors of them, Kathy! I’ve also lightly boiled or blanched them and added to other veggies and they can be cut decoratively for special occasions. I look forward to spring because of the promise that it holds –all that nice weather lies ahead to look forward to. Your radishes are gorgeous. There certainly is a lot of promise in springtime. Thank you! It is so easy! You can press all kinds of veggies actually.